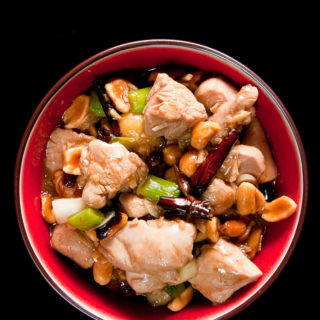 Kung Pao Chicken is one of my absolute favorite dishes whenever I eat Chinese food, even at the cheapy-Chinese steam table places. I think it’s the combination of texture and flavor: Hot, fried chiles, silky chicken, crunchy peanuts. What’s not to love? I did a little research and learned that, along time ago, this dish was often made with wild Chinese pheasants — the bird is originally from China, not North America — so that gave me a good reason to learn this recipe. I never found a recipe I really like until I read Fuchsia Dunlop’s Land of Plenty: A Treasury of Authentic Sichuan Cooking. 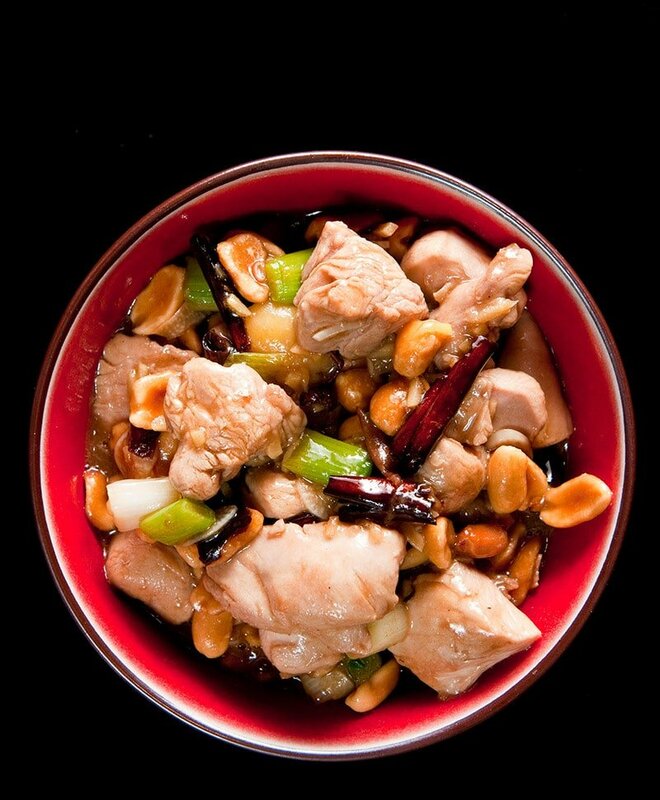 Kung Pao Chicken is originally from Sichuan, and it is supposed to be loaded with chiles and that crazy spice, Sichuan peppercorns, which make your mouth a little numb. My recipe is a little bolder than hers, a little saucier, too. I like a decent amount of sauce with my rice. When you make this recipe I strongly urge you to seek out the authentic ingredients: Chinese black vinegar, Shaoxing wine, potato starch, Sichuan peppercorns. If you can't find them, it OK to substitute, but the recipe won't be authentic. This recipe was designed for pheasant, but it will work with any white meat: chicken, turkey and rabbit are good alternatives. Whisk all the ingredients for the sauce together and set aside. Whisk together all the ingredients for the marinade in a medium bowl. Cut the pheasant breasts into small chunks of about 1/2 inch across and mix in with the marinade ingredients. Set aside for 20-30 minutes. Meanwhile, slice the garlic cloves into slivers, mince the ginger as fine as you can and cut the green onions into 1/2-inch pieces. Break the dried chiles into 1/2-inch pieces and shake out as many seeds as you can. Set a wok over high heat for 1-2 minutes. Add the chicken fat and heat this for another minute. Add the Sichuan peppercorns and the dried chiles and stir-fry 30 seconds. Add the pheasant and stir-fry for 30 seconds, then add the garlic, ginger and green onions and stir fry another 15-20 seconds. Stir the sauce well and pour it into the wok. Add the peanuts and toss to combine. Bring to a rapid boil and stir fry for 30 seconds. Serve immediately over white rice with a beer. In the 90’s I spent 3 weeks in Ya’an, Sichuan, a little city on the road between Chengdu and Lhasa, Tibet. Back in North America, I’ve never been able to find anything as good as the chicken that the cook at the Foreign Students Residence at Sichuan Agricultural University used to make for us. I’m happy to give this a whirl and see if it is more like what I remember. I’ve made this and the Dong’an pheasant a few times, as I keep getting pre-packaged frozen bags of skinned breasts and legs. The breasts go into this and the legs get simmered for a stock then shredded and used for the Dong’an, with the lovely soup for the next day. Red bell pepper is a nice addition to this one, if anyone is looking to add some veggieness. Just add some chunked up when you add the ginger and green onions. Hank, your site is great and it’s been helping me through mountains of game meat. I know lots of hunters who don’t eat a ton of game or whose wives find the idea of eating wild animals icky, but who know I love to cook. Keep the recipes coming, I’m a daily visitor and I’ve learned something with every new recipe I’ve tried. Just made this with pheasant from yesterday’s take (Tehachapi, Ca). So delicious! It’s a keeper!